The demand for qualified solar and small wind technicians is rising, as more consumers and businesses apply solar energy and small wind systems in their communities. Many employers prefer employment candidates who are certified. 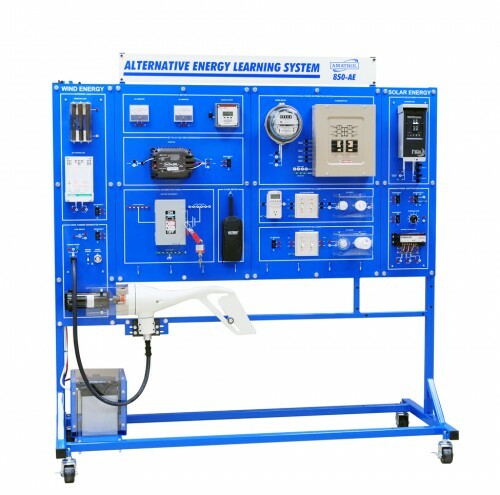 Amatrol’s 850 series Alternative Energy Learning System supports the training necessary to prepare for portions of the solar and small wind certifications offered by such certifying groups as NABCEP (North American Board of Certified Energy Practitioners), SWCC (Small Wind Certification Council), and ETA (Electronics Technicians Association). The 850-AEC Alternative Energy Learning System teaches students key skills needed for job success in small wind alternative energy and solar energy. Students will receive hands-on alternative energy training and skills they can use on the job. Critical skill areas covered are system connection, operation, and programming of solar PV (photovoltaic) and small wind systems in commercial and residential applications. The Amatrol Alternative Energy Learning System – Wind and Solar includes a mobile workstation with solar PV components, small wind components, multimedia student curriculum, and teacher’s assessment guide. The mobile workstation is equipped with pre-mounted components for easy inventory. Wind turbine and solar panels also allow for outside use with expansion capability for teaching grid-tie and data acquisition. Amatrol also offers alternate workstation configurations for either small wind or solar individually. The Amatrol 850-AEC Learning System’s wind and solar circuits can be used indoors with sun and wind simulators, or outdoors via the detachable solar panel array or client-supplied external wind and solar sources. 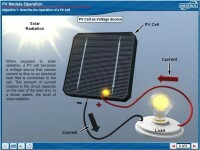 The solar array easily disconnects from the workstation and sets up outdoors. The 850 Learning System can also be connected to client-supplied roof-top solar panels or wind turbines with the addition of optional interface connections. Real world components commonly found in commercial and residential environments to help make learners job ready are showcased in the 850-AEC. For example, the 850 is equipped with a combiner box and a multiple panel solar array, allowing learners to connect panels in series and parallel. The MPPT charge controller, which is the most common controller used today, allows programming and communications via Ethernet from an LCD panel that are typical of current practices. The 400W wind turbine and diversion load controller are commonly found in small wind applications. Amatrol’s 850-AEC Learning System for wind and solar offers a number of options that can greatly expand the capability of the system. The 85-GT1 Grid-Tie Learning System – Solar features a single phase inverter that enables the system to connect to the classroom grid, typical of PV systems being installed today. The 85-ADA1 Data Acquisition Learning System – Wind and Solar features a multi-point data acquisition module, PC software, and sensors that monitor voltage and current in various parts of both wind and solar circuits, enabling students to study operation via data analysis. Both options are panel-mounted units that easily add to the 850 workstation.